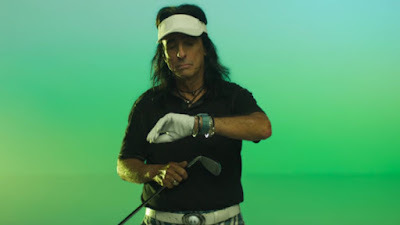 Alice Cooper is among the celebrities featured in a new ad campaign for Apple Watches. Adweek reports Cooper joins musicians Nick Jonas and Jon Batiste and actress/fashion designer Chloë Sevigny in the series, which aims to show how the high-tech timepiece can make each day better. Half of the eight commercials feature sports themes – including real life golf enthusiast Cooper – who swings futilely at golf balls before settling for burning some calories as measured by his watch. Cooper will spend 2016 juggling solo dates and performing shows with The Hollywood Vampires. The original shock-rocker recently extended his North American tour and unveiled a full live schedule with the supergroup that sees him joined by Johnny Depp and Aerosmith’s Joe Perry. The Hollywood Vampires lineup will be see Robert DeLeo of Stone Temple Pilots step in on bass for Guns N’ Roses' Duff McKagan due to his other commitements, and will be rounded out by drummer Matt Sorum, guitarist Tommy Henriksen and multi-instrumentalist Bruce Witkin on piano, percussion and guitar.